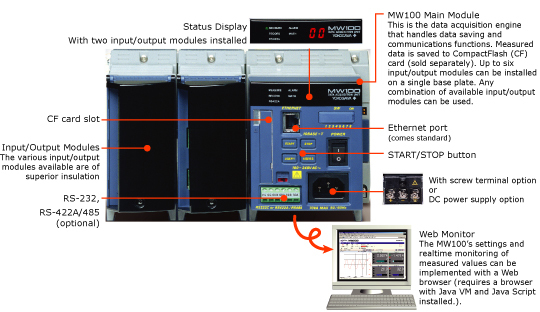 The MW100 is a scalable, high performance data acquisition and data-logging platform designed for standalone, networked, or PC-based operation under industrial operating conditions. It supports remote web-based configuration and monitoring. With its DIN rail design, it is often mounted in an enclosure or cabinet. 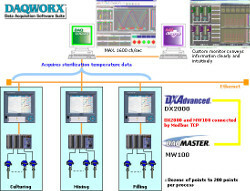 The MW100 is a scalable, high performance data acquisition/data-logging platform designed for both PC-controlled and stand-alone operation under harsh operating conditions. 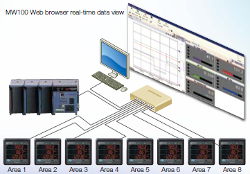 Open Ethernet connectivity with web-based configuration and data monitoring functions allow MW100 to handle a wide range of monitoring and historical logging functions. See real time trends with your web browser from any PC and no special software. A full range of input/output modules handle all of your process inputs with fast measurement speed and high noise immunity for rock-solid performance. Supports CompactFlash (CF) cards 6 of up to 2 GB Continuous data acquisition is possible on 60 channels at 100 ms for approximately ten days with a 2-GB card, or for three months on 60 channels at 1 s.
MATH function on the main module available with the /M1 option. The operating temperature range for the input modules and main module. The operating temperature range of the output modules is -20 to 50°. 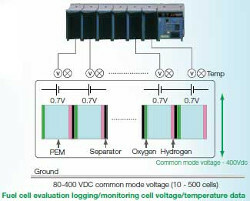 Note that the power cord supplied with the main module differs depending on the operating temperature range (see the specifications on page 7). If the operating temperature range specification of the supplied standard power cord does not meet your requirements, we recommend that you select a screw-type terminal rather than the plug type for the main module power inlet, and supply your own power input cable. The operating temperature range of the AC adapter used with DC power supplies is 0 to 40°. Please consult with a representative for applications involving temperatures below -20°. The withstand voltage value with the MX110 input module. For the withstand voltage values of other input and output modules, please refer to the specifications for those modules (GS 04M10B01-01E). CF card not included (sold separately). 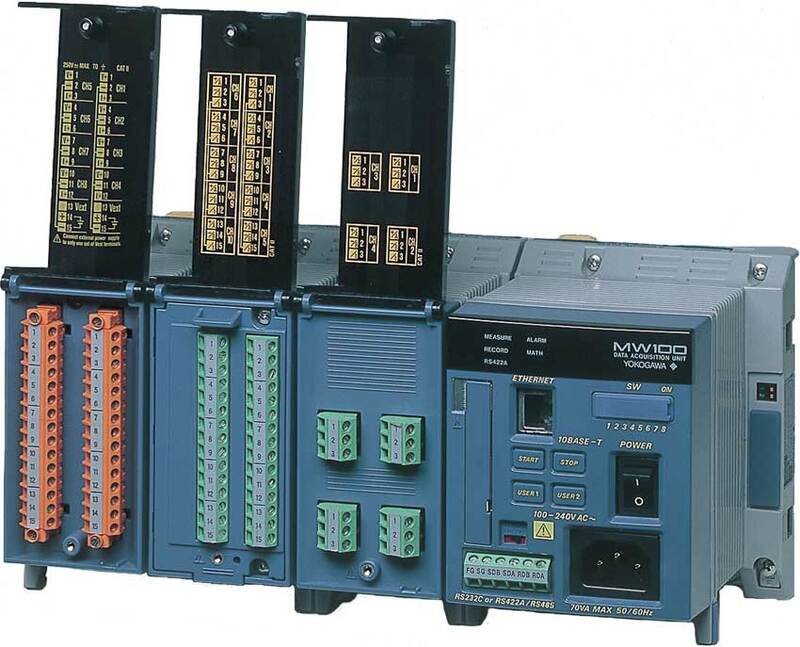 A custom MW100 measuring system is comprised of three elements; the MW100 main module, MX Series input/output modules, and MX150 Series base plate. The system can be bench mounted as-is or DIN rail mounted for rack or panel installations. A DIN rail-mounting bracket is included with the MX150. The input/output modules, base plate, and accessories are all the same as those for the MX100 DAQMASTER series (AC adapter is for the MW100 only). AC adapter for the DC power model. Screw (M4) terminal block (RJC (reference junction compensation) included). For use in combination with 772062. Compatible with MX110-UNV-M10, MX115-D05-H10, and MX115-D24-H10. Connection cable between input modules and the screw terminal block. Plate with clamp terminals (RJC included). 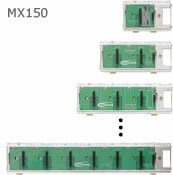 The MW100 can be connected to multiple PCs at the same time. This allows monitoring and sharing of measured data by multiple users. A login function is included to enable assigning of access rights. A large data acquisition system of up to 360 channels can be assembled using multiple MW100s and standard MODBUS TCP Ethernet communications. 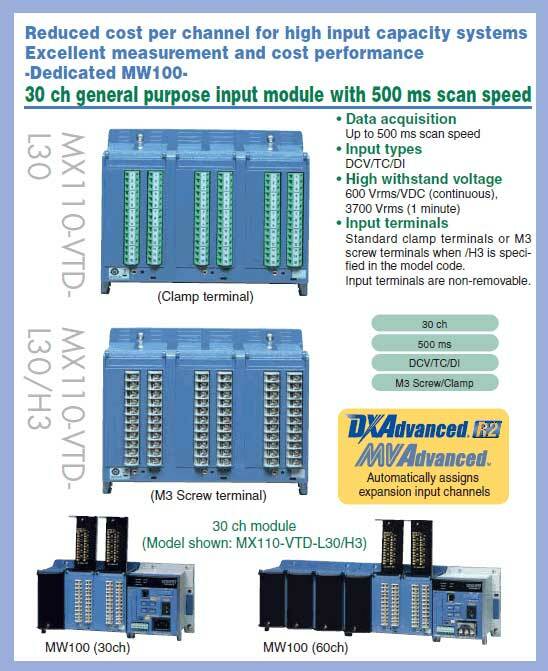 When equipped with the /M1 math option, the MW100 can acquire up to 300 channels of external data from additional MW100 units or other devices such as a PLC using MODBUS TCP communications. 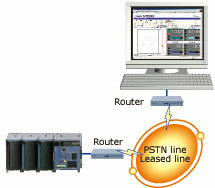 This provides a total system capacity of 360 channels (60 built-in measure channels + 300 external). 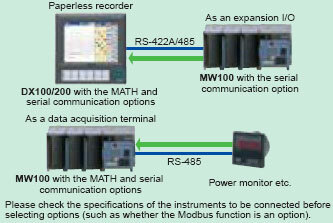 Serial MODBUS RTU communications (RS- 232 or RS-422A/485) can be ordered as a separate option with the same capability. 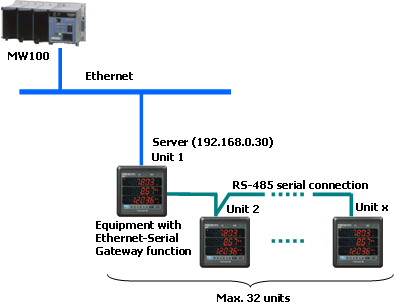 An optional serial MODBUS RTU interface provides data exchange functions with other devices such as recorders, PLCs and controllers. 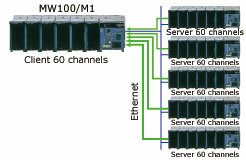 In this mode, MW100 can serve as expansion I/O or as a data acquisition terminal for another connected device. 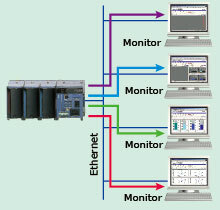 When the measurement location is located remotely from the data monitoring station, a dial up phone connection can be used for communications. 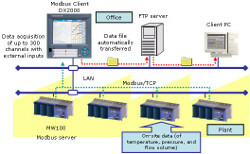 All MW100 web browser-based data monitoring and FTP functions can be used via this connection for remote data acquisition applications. Screen updating may be slower depending on the communication environment. The MW100 can synchronize its clock to a network time-server using SNTP (Simple Network Time Protocol), allowing any number of MW100s in a system to have precisely matched time. Both SNTP Server and Client modes are supported. 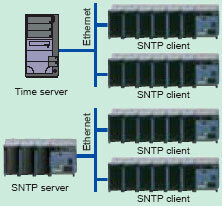 In Server mode, one MW100 can acquire time data from a server using Client mode. 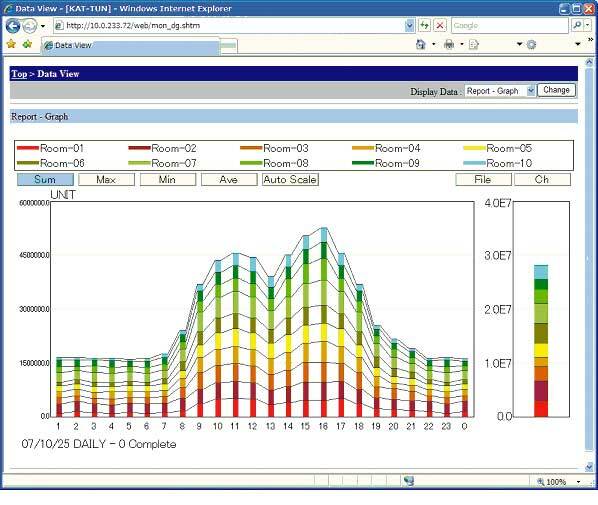 It can then serve time data in Server mode to other MW100s that function as Clients. Clock synchronization functions are allowed only when the measurement interval within the unit is two seconds or longer. Select a CF card appropriate for the required data recording time. 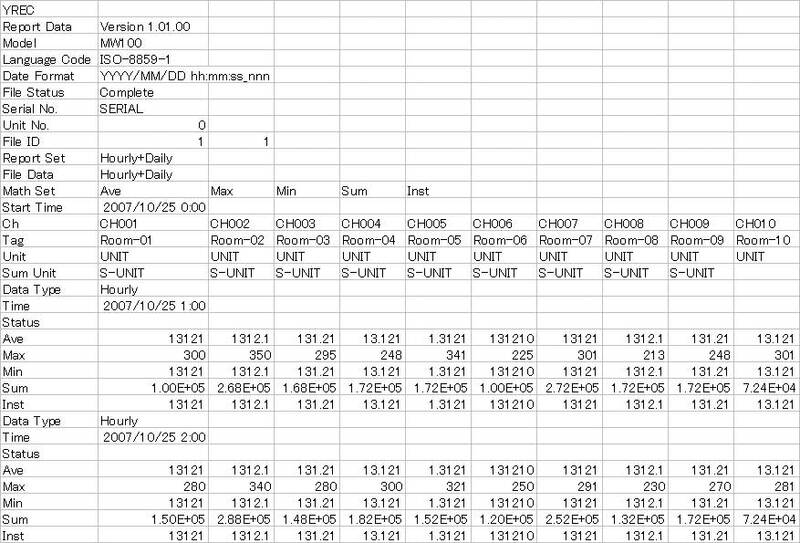 See the table below for the approximate time's worth of data that can be recorded for each size of card. 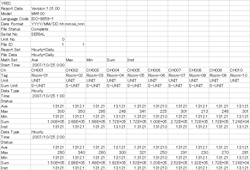 For example, when recording ten channels of data at a 10 ms measurement interval, the approximate amount of data that can be recorded to a 128-MB CF card is 8.8 hours worth. On the MW100, measured data is recorded to the CF card via an SRAM. The SRAM is backed up with a battery (for approximately ten years), ensuring that even in the event of a power failure, data prior to the failure is not lost. At a measurement interval of 10 ms, the maximum number of channels that can be measured is 10. Eleven or more channels cannot be measured at a measurement interval of 10 ms.
At a measurement interval of 50 ms, the maximum number of channels that can be measured is 30. Thirty-one or more channels cannot be measured at a measurement interval of 50 ms. 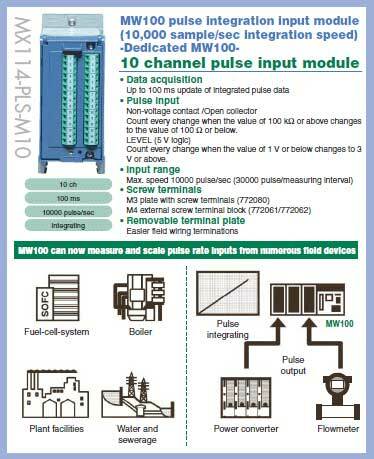 The MW100 enables mixing of three different measurement intervals in a single unit. Measurement intervals can be set for each individual module. This allows you to measure various items under test at the most appropriate measurement intervals. Also, you can set data recording conditions1 for each measurement interval, thereby using the available space on the CF card as efficiently as possible. Single: Save a file up to the specified size then stop recording. Full Stop: Stop recording once the CF card is full. Rotate: When the capacity of the CF card has been exceeded, the oldest files are deleted to free up space, then recording continues. The MW100 is equipped with built-in trigger functions. 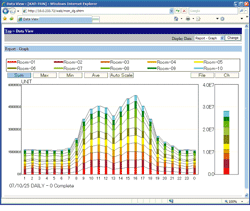 Data recording can be started based on alarm values, time, external contact input, or other parameters. 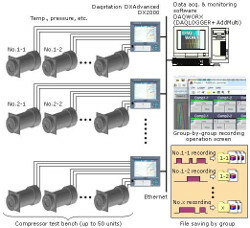 Once recording is started, it can be set to progress continuously or according to a specified data length. When specifying a data length, a pre-trigger can also be set. The MW100 also provides a data thinning function. Portions of measured data can be omitted at regular intervals during measurement (minimum of four seconds) before data is recorded. Using the trigger and data thinning functions together provides "coarse" recording of general data and "fine" recording of abnormal data. This function is included with the MATH (/M1) option. Patterns can be output from the analog output and PWM output modules (MX120) by inputting the coordinates of the pattern you wish to generate. In the pattern output shown in the figure below, points (X1,Y1) through (X10,Y10) are input in advance, and the output is generated accordingly. Creates hourly, daily, weekly, and monthly reports synchronized to measurement start and stop. On mesurement stop action, a report file is saved to the MW100 CF media. 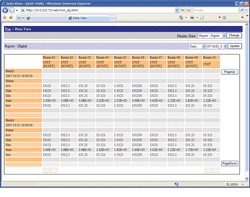 A report status display is provided in the web browser monitor mode. Report data is saved to a text (.txt) file compatible with common software applications. 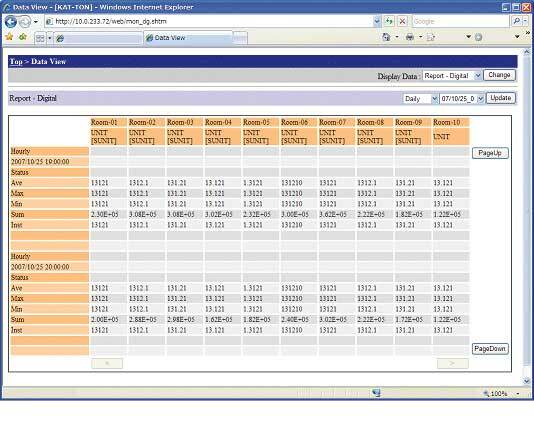 Use Excel or other applications to create custom reports from the report text file. The DX2000 can use MW100 system hardware as additional external input channels. 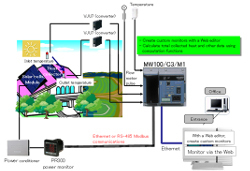 They can automatically recognize MW100s on a network and perform automatic assignment of the MW100 input channels to build a large multi-point data acquisition system quickly and easily with no PC requirement. System requirements: /MC1 external input option and /M1 math option. See the product bulletins and general specifications for details. *The firmware version of R2.22 or later is required for the MW100 to support the automatic assignment function. Lite Monitor: Enables monitoring with a digital display, even in environments with low transmission speeds. Setting List: A list of settings that can be displayed in TXT (text) or "printable" format. Bit output computation: Enables output of the value of specified bits (0/1) of reference channel data (positive integers expressed as bits). 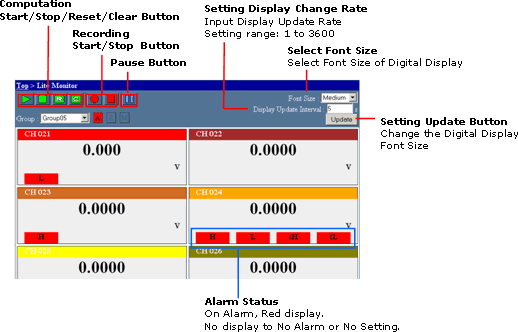 Alarm DO output: Preset settings of Off, Open, and Close were added as operations upon stop or error. Added a coil function for mapping data on communication input channels (C001 to C300). Added input relays for measurement channels, computation channels, and the main unit operating status. Added input registers for mapping main unit mode information. Summer Time Setting: The starting and ending date/time for Summer time can be set. By using Ethernet/IP in the standard interface, the most appropriate multivendor systems can be readily developed for users. In addition, instruments can be added or modified without any additional programming, thus improving efficiency. 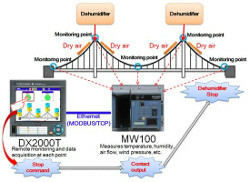 By making it easier to install the MW100 Data Acquisition Unit in systems and thereby facilitating the chronological monitoring of equipment operating conditions and quality data, trends can be analyzed with higher precision. 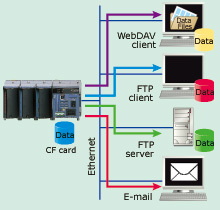 Data can be regularly transmitted at high speeds to instruments distributed over a wide area. With Ethernet, maintenance staff do not need to learn a dedicated protocol for each instrument, making it easier to control the network. Note 1: You must install firmware R3.02 to use EtherNet/IP with the MW100. Note 2: EtherNet/IP is an open industrial application layer protocol supported by ODVA (Open DeviceNet Vendor Association). A user authorization feature has been added to the SMTP Authorization function. SMTP authorization (SMTP Service Extension Authentication: SMTP AUTH) means that verification is made when sending e-mails so that only successfully authorized users can send e-mail. This newly added authorization function serves to further strengthen security for sending of e-mails. 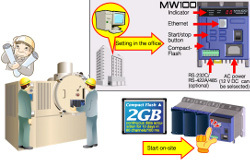 The MW100 Data Acquisition Unit helps you to maintain your facilities. It can be easily installed during regular inspections and the like, to survey whether the facilities are operating normally. 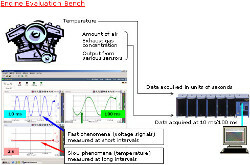 If it detects data indicating a fault, its trigger function can analyze and examine the details of the fault. The MW is used extensively for data acquisition in various kinds of conveyance equipment including automobiles, industrial vehicles, in-plant vehicles, ocean shipping vessels, and automated materials handling systems. 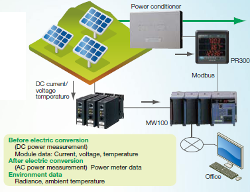 In addition to being compact and not requiring a PC for data acquisition, the MW can be run under DC power and be operated under harsh conditions (-20° to 60°). 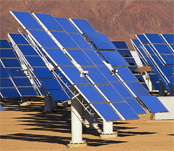 The MW100 can be used for measurement and monitoring at facilities that use solar heating and lighting. The MW100 is employed by customers who are device manufacturers when they deliver a device to the end user, for on-site monitoring to check that the delivered device is operating stably. If settings are made to the MW100 in the office beforehand, then all that is necessary is to take it to the site and begin data acquisition thus, anyone can conduct on-site data acquisition. 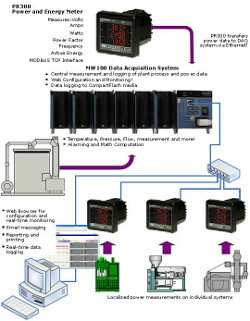 Conventional monitoring of multipoint signals such as temperature and relatively high speed signals (flow and rpm) is often carried out using dot and pen recorders, but a combination of the DXAdvanced series paperless recorder and the MW100 data acquisition unit handles multipoint recording tasks from a single unit. Data from tests of multiple compressors run in parallel are saved to separate files for each compressor using the DAQWORX software suite. Recent years have witnessed increasing corporate initiatives for energy savings and environmental protection due to laws and other ordinances, and this has affected power monitoring needs. 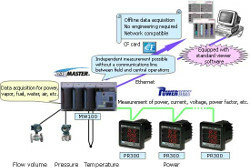 As opposed to power monitoring on a large scale such as on the level of an entire factory, there are more and more examples of small scale power monitoring systems such as for manufacturing lines, or even for specific manufacturing equipment. 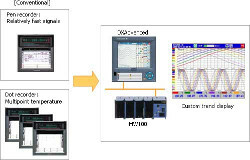 For data recording and management by the DX in applications involving multipoint measurement such as monitoring of temperature in a boiler, there is a convenient remedy to the problem of too few inputs.